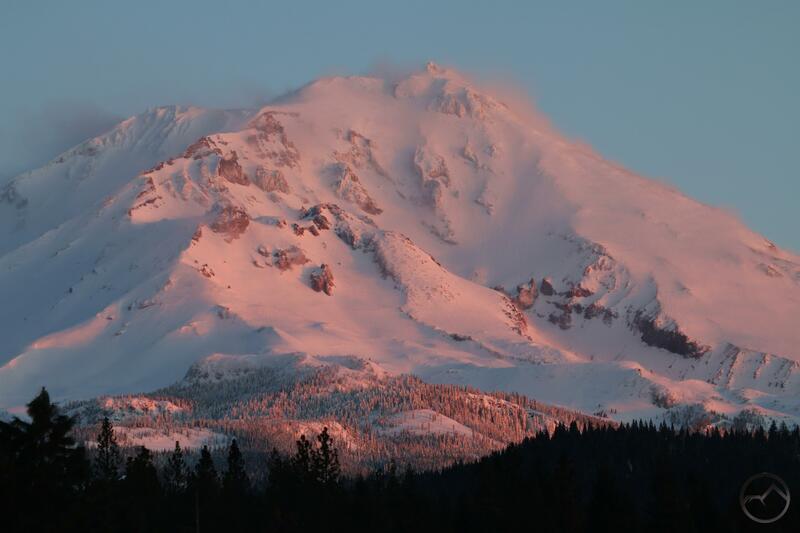 Clear skies and sunrise glow on snowy Mount Shasta. Well that was fun. Like the rest of the mountain west, the Mount Shasta area has endured another significant storm system. I like the snow and I always look forward to it. I don’t mind clearing it off driveways and walkways and such. What I do mind is when it snows a lot and then rains a lot and everything turns into a soupy, mucky mess. That, unfortunately, is what we got. Add to the unfortunate stew a long stretch with no sunlight and cold but not cold enough to keep everything frozen and you basically have the worst possible winter combination. Thank goodness that is over, for now at least. This morning, the first with clear sky in a while, was beautiful. A string of errors kept me from getting on the east side of Mount Shasta but I was able to at least catch the glow along Sargents Ridge as the sun came up this morning. It was just nice to see the mountain, though disappointing to miss the snow flurries all lit up by the rising sun, the view that was surely to be had in McCloud. Needless to say, Mount Eddy and Black Butte were also thoroughly smothered in snow. With Mount Shasta still in shadow on the west side and no unusual clouds to highlight the mountain, these two neighbors offered the more interesting spectacle. The warmer temps (relatively speaking, of course) of the last few days had raised the snow line and nothing below 5,000 feet seemed to have much snow on the trees. This was certainly the case on Black Butte, which seemed so be completely encased in rime ice, rather than snow. On Mount Eddy, the snow was everywhere and it looked deep too. 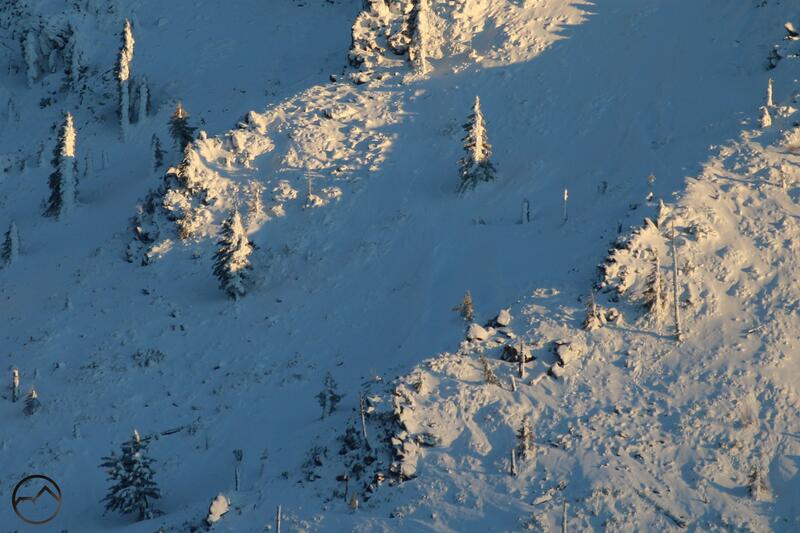 All the trees in Eddy Bowl were blanketed with deep snow. 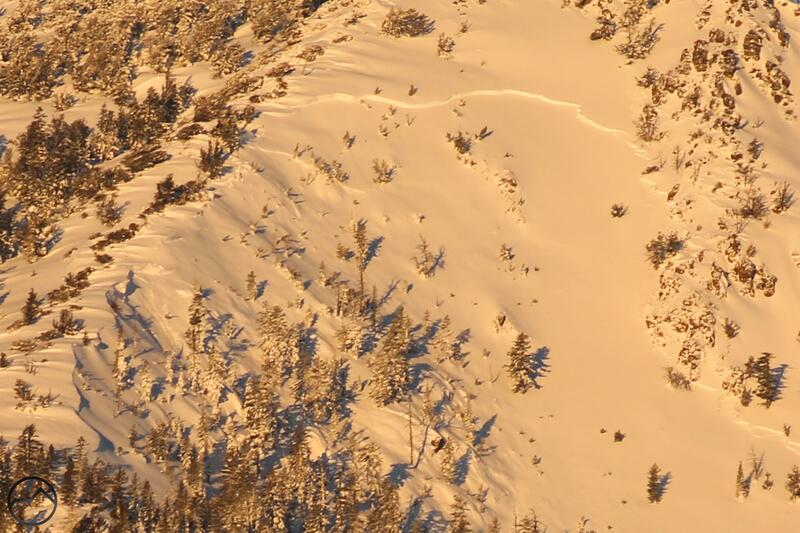 Some areas where deep snow had piled up, it looked as though avalanches might occur. The depth of the snow from this storm is a bit deceiving. We probably go 3 feet or more at our house but the intervals of rain-induced melting and the natural settling does not show quite how deep it is. The peak really occurred on Tuesday. More snow fell after that but it never quite equaled the conditions on Tuesday. For comparison, look at the progression of my backyard from the big storm back in January of 2017. That was a lot of snow and there was no rain to start it melting instantly. Thankfully, no matter how bad the conditions got in the storm, it was usually possible to head up to the Shasta Valley and get some sunshine. Granted, it rained there too, but Mount Shasta’s rainshadow kept most of the precipitation at bay. Nonetheless, the puddles, ponds and rivers were all full. This was a particularly welcome break on Wednesday, as the stormy weather persisted to the south. A quick trip north recharged the emotional batteries to help my kids and I ride out the remainder of the storm. The Goosenest is lost in storm clouds. Looking east toward Herd Peak and Sheep Rock. Typical storm view of where Mount Shasta is normally visible. This continued to be the case Thursday. The sky was cloudy but Mount Shasta was still visible from the north. While there. The valley looked gorgeous, ringed by snow-covered mountains. It was nice to see bare earth, not covered by feet of snow. I never tire of heading into the high desert of the Shasta Valley. 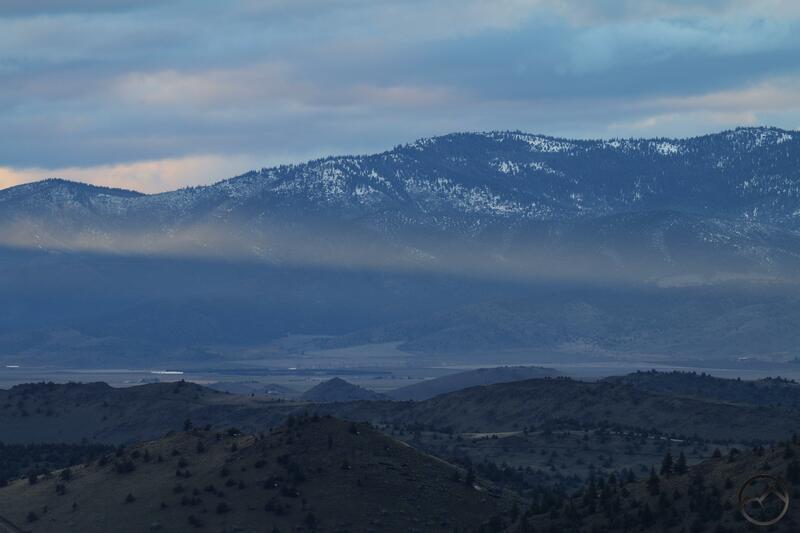 A beam from Thursday’s setting sun cuts across the Little Scott Mountains and the Shasta Valley. The forecast is currently calling for some calmer weather that, while projected to be overcast at times, will be a nice break from the last week. With March left of the really wintry season to go, I think my family is officially getting cabin fever. Though the extended forecast is calling for a couple more weeks of precipitation, I am hoping the second half of March really dries out. May it be so. Amen. Though the clouds came back in during the afternoon but it was still possible to see the final sunset of February 2019. 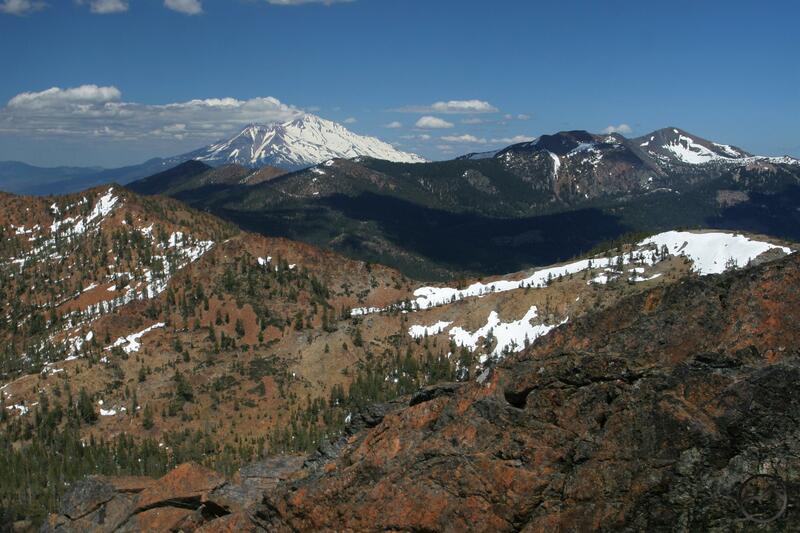 Mount Shasta and Mount Eddy are seen from Cory Peak in the Scott Mountains. Some big changes are afoot for land administration and trail development here in the Mount Shasta area. In the next few months, the Shasta-Trinity National Forest will be closing a deal that will transfer 19 parcels of land from private ownership to the Forest Service. These parcels, totaling around 10,000 acres, are spread across the Scott Mountains and the Eddy Range portion of the Trinity Divide. This is prime mountain real estate, filled with lakes, rocky peaks, lush meadows and expansive forests. In the coming years, trails will likely be developed through this new real estate, adding miles of hiking opportunities. The impetus behind this transaction is the Pacific Crest Trail. Nearly every parcel is traversed by the PCT. The land owner was gracious to permit construction of the trail on their land but there was always a tenuous status for the trail and access rights. The funds necessary to complete this sale were secured largely through the agency of supporters of the PCT, thus enabling hikers, the PCTA and the Forest Service to have more control and flexibility in how the trail is routed and what kind of spurs and loops can be developed off of the PCT. 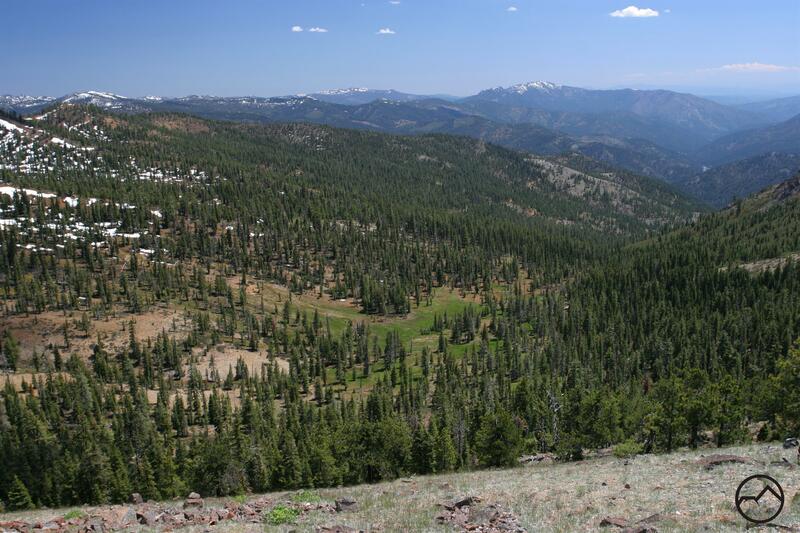 This land joins over 2,500 acres recently purchased on Mount Eddy. One section of this additional land includes a lengthy segment of the PCT while the rest of the land includes lakes, awesome cliffs and meadow-fringed ponds. Equally important, these additional parcels will permit legal access – and the subsequent development of trails – to many of the prettiest features on Mount Eddy. The possibilities for exciting and spectacular new trails are vast. The red areas denote the new sections being acquired. The orange sections are those on Mount Eddy that were recently purchased. The Pacific Crest Trail is marked in yellow. This may not seem like a big deal to hikers who already explore this area via the PCT or off trail. The land owners don’t seem to make a fuss about people crossing the land. This may be the case, but the transfer of land from private to public hands means that a whole new generation of trails may now be developed. 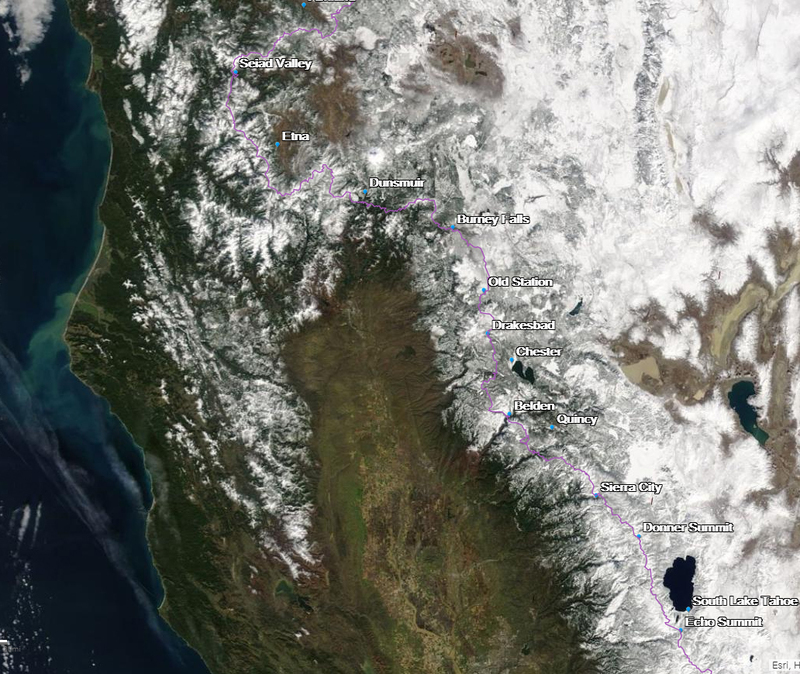 Right now, only the Pacific Crest Trail crosses these mountainous areas. In the future, it is possible for new trails to be developed that will access lakes, the PCT, meadows, passes and peaks. The Eddy Range and the Scott Mountains have the potential be the home of a fantastic trail network for both backpackers and day hikers. Rock Fence Lake is a first rate hiking destination. Following the acquisition of the land, the current plan is to take it slow. A large reason for this is that all the resources devoted to new trail construction are being consumed by the awesome Gateway Phase II project. However, once that is completed, if a Phase III is not imminent, then energy can be refocused onto the Scott Mountains. The desire is there to construct new trails, trailheads and campgrounds and to make this area a vibrant recreation destination. Several lakes, previously privately owned, will be opened up and accessed via trail. One excellent example of this is Rock Fence Lake, which will surely become a popular hike. Other lakes, including Cabin Meadow, Bluff, Bull, Masterson Meadow and Grouse Creek Lakes will all be added to the national forest and trails to them will be developed. The Little Trinity River, a seldom appreciated creek, will also be open to hiking. Another awesome feature is the intended resurrection of a long segment of the Sisson-Callahan Trail. This was the original, 19th-Century route that connected the town of Callahan to Mount Shasta. At the time, Highway 3, which passes through Callahan, was the primary north-south route through this part of California. This made the SCT a critical transportation route. 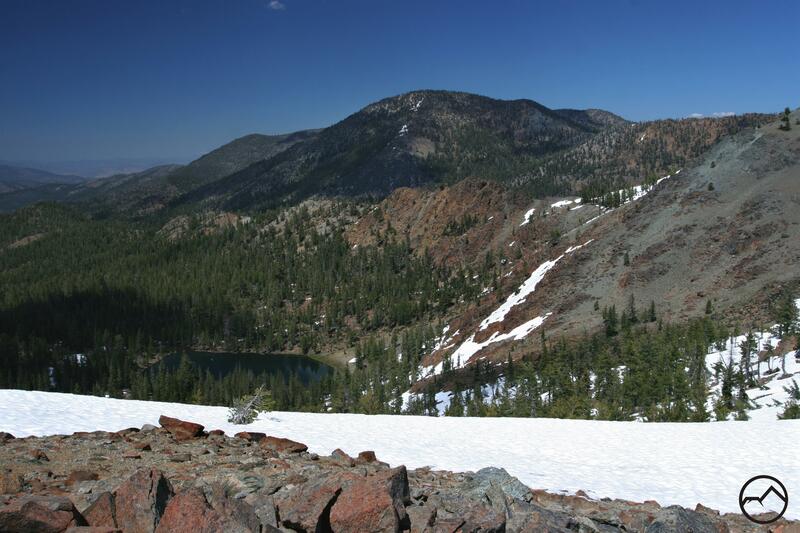 Currently, the section running from the near Lake Siskiyou up to Deadfall Basin is an active trail. In the near future, we may see the original pass at North Fork Sacramento/Bear Creek put back to use and then have the trail continue west along Bear Creek, cross the Trinity River and then climb up to Bull Lake. From there the plan is already forming to have it continue through nearby Robbers Meadow and then reconnect to the Pacific Crest Trail. Bull Lake along the PCT. Mount Shasta and Mount Eddy from the Scott Mountains. Looking down on the Caldwell Lakes. Natural graffiti along the trail. China Mountain and High Camp Basin. Mount Eddy from the Cement Bluff. The Cement Bluff above Bluff Lake. 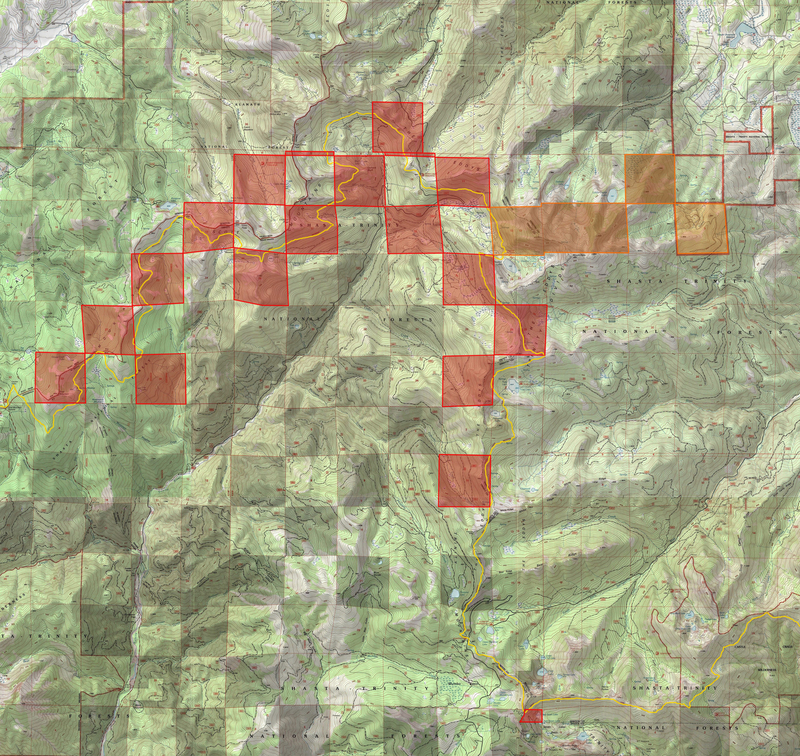 Below is a map with a hypothetical trail network in the Scott Mountains based on conversations with the forest service. The proposed trails are marked purple. The blue line is the original route of the Sisson-Callahan Trail, which will likely be restored. The Eddy Range has also seen significant additions of land. The previous land acquisition on the east side of Mount Eddy brings the potential for a host of new trails that access areas like Eddy Bowl. Also, the holy grail of lost areas, Dobkins and Durney Lakes, are now potential destinations for new trails coming from the Morgan Meadow and Eddy Bowl areas. Even more enticing, the section of land just east of Parks Creek Pass is being added. 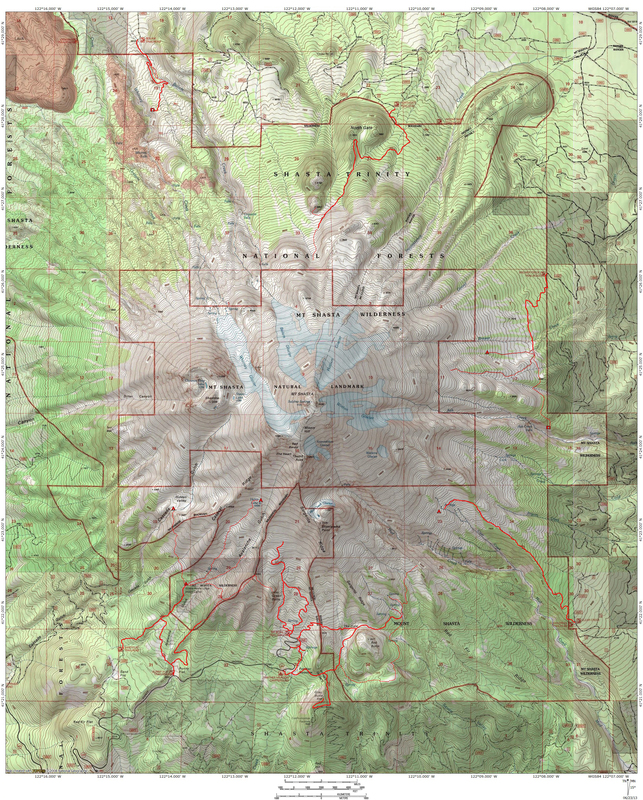 This yields the opportunity to actually construct a loop around Mount Eddy, connecting Deadfall Basin, the North Fork of the Sacramento Basin, Eddy Bowl and the Dobkins and Durney Basin, as well as a nice side trip up to Little Crater Lake. This would be an absolutely spectacular backpacking trip! Below is a gallery of some of the lands added the transfer. Note that Toad Lake is already part of the national forest but the cliffs behind it and to the north of Porcupine Peak were not. The area behind Toad Lake is now public land. Another view of Porcupine Lake. Toad Lake and Porcupine Lake basin. “Foxtail Basin” beneath Mount Eddy. The potential for new trails in these areas is astounding. It is a significant opportunity to develop the recreational resources this area has to offer. Both locals and visitors will benefit from the construction of new trails and the creation of new campgrounds. The potential to complement a world class mountain like Mount Shasta with a world class trail network to the west would be an awesome boon to all who enjoy the Mount Shasta area. I should close with a word of caution. The building of trails in new areas always means the introduction of more people to areas previously minimally impacted by hikers. There is always a tension between use and preservation and I feel that tension in the very existence of this website. In the end, I tend to favor more trails and, hopefully, robust Leave No Trace training, though I remain sympathetic to those who think no or fewer trails is better for the land. 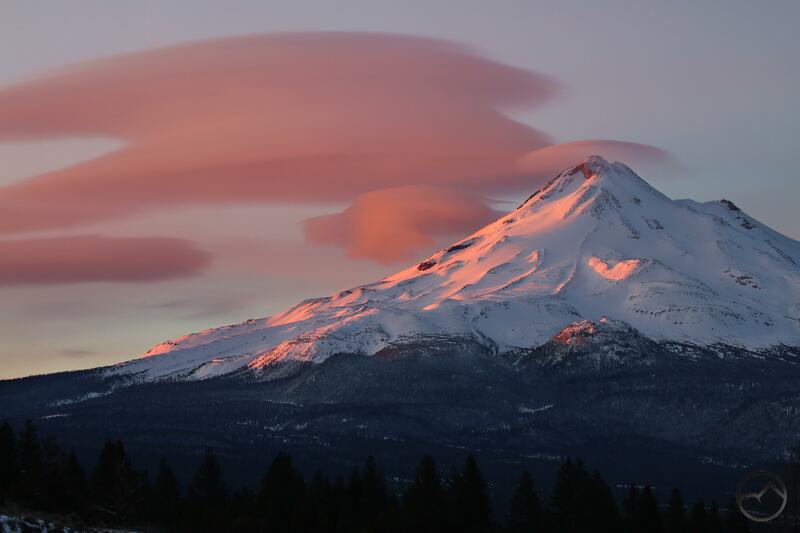 The rising sun sets lenticular clouds and Mount Shasta’s eastern flank aglow. Mount Shasta does not fail to impress anytime it wants to put on a show. 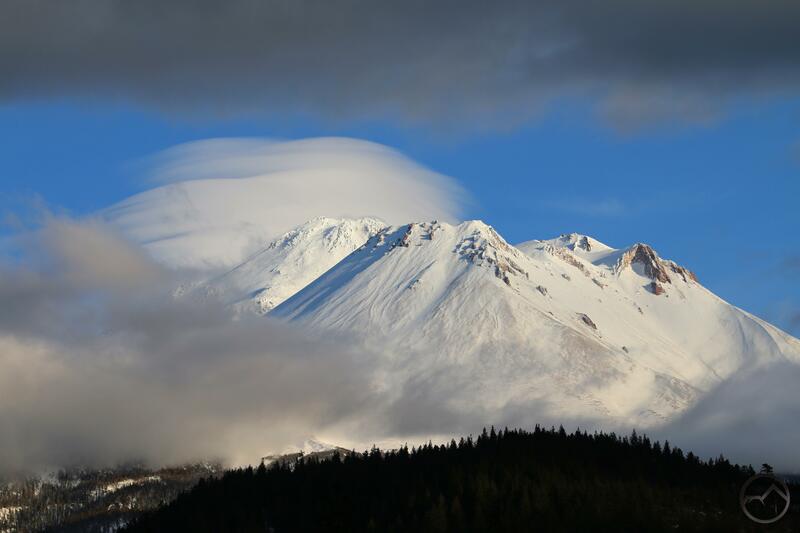 This was certainly the case with the excellent clouds that graced Mount Shasta on Friday morning. It was an epic lenticular display. Looking at the weather forecast, I had anticipated there might be an event due to the changing weather systems. I was up early, naturally, so I headed out to check conditions. A little before 6 AM there was a single small disk hovering just south of Mount Shasta. I wasn’t too impressed but thought it had the potential to grow. The north side seemed like the way to go, since it would put the cloud in frame with the mountain better. As I headed out Highway 97, could see the cloud expanding and adding more disks to the forming stack. I knew it was going to be a good morning. I got to a good spot near Deer Mountain Road and set up my camera. The light arrived shortly afterward and it was spectacular. 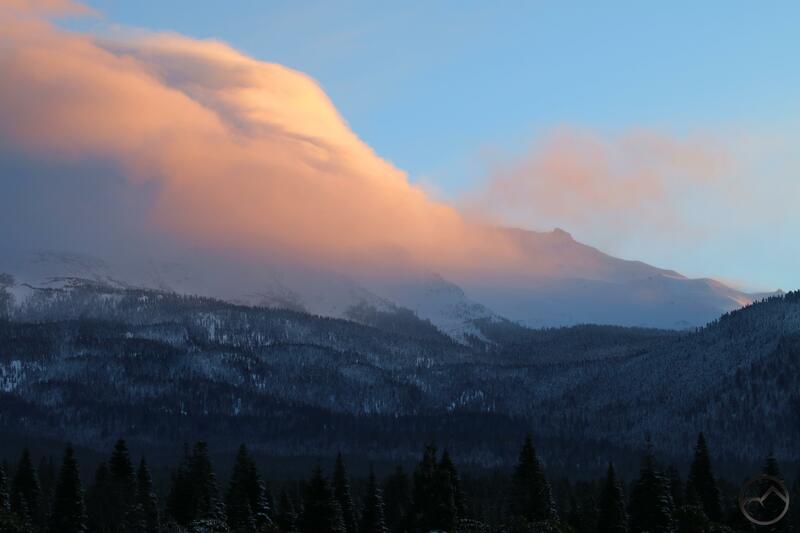 Both the clouds and Mount Shasta were lit up with rose colored morning light. Though it was 7 degrees outside, it did not feel as cold as the last time I had visited this spot. This made focusing my camera easier, thankfully. It was an incredible sunrise. I captured some images and headed out. The looming presence of the clouds was magnificent. As I drove back to Mount Shasta, the parallax had changed the appearance of the mountain and the light had shifted from rose to gold. The details of the cloud, including the very fine strata of the lenticular stack were now much more obvious. I stopped and captured a few more images, glad to have a chance to enjoy a different perspective. Though the north and west sides of the mountain were shaded, much of the large lenticular glowed. I continued back home but as I neared one of my favorite rock piles that I take my kids to scramble on, I was shocked by how much the cloud seemed to have grown. The sheer immensity of it was breathtaking. Even though I had traveled far enough west that Mount Shasta was now shadow, I could not resist stopping at the rock pile and capturing this magnificent scene. It was a grand morning indeed. Later in the morning I had occasion to head into town. I could tell from my house that the lenticular persisted. As I headed into town, I stopped and captured a couple more images of the awesome cloud. While still impressive, it had diminished considerably. The small lenticular that had been hovering over the summit had correspondingly grown a little. It was a neat arrangement. Amazingly, by 11:00 AM, the cloud had completely dissipated. It was quite disappointing, since I had really hoped to capture this cloud at sunset. Such is life. If this seeming blow is all we have to deal with, then we are quite blessed. As the day progressed, I kept an eye on the mountain, hopeful that the cloud might reform, as is often the case with lenticulars. Unfortunately it did not, only a few thin clouds clung around the summit. However, as sunset approached I noticed a slight curve had formed on one of the wispy clouds. Curious to see what it looked like on the other side, I headed north. I was pleased to find that the northern side of Mount Shasta sheltered a “lenticulish” cloud. The winds were still so I went to my favorite reflection pond in the Shasta Valley. It proved to be an unexpectedly scenic sunset. 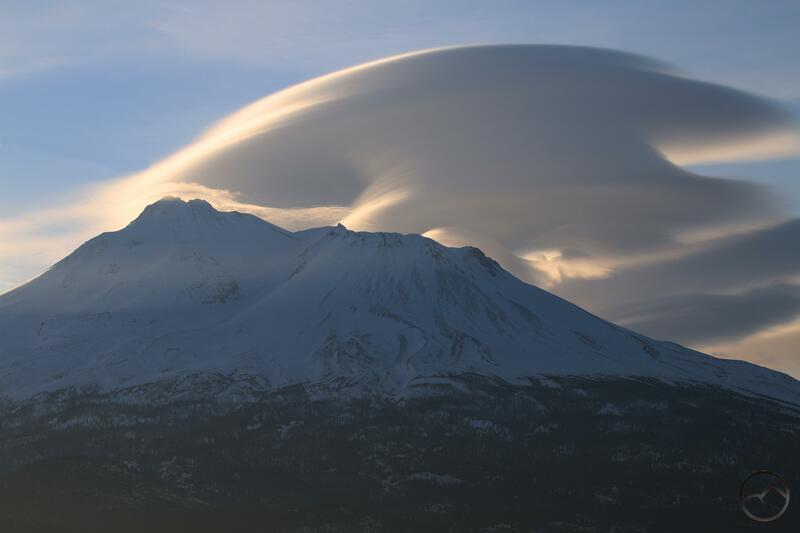 This lenticular season has been one of the best since I moved to Mount Shasta. There has been numerous events and some have been in the upper echelon of formations that I have witnessed. This is fitting, since this winter has been a good one in terms of snow too. Most of the mountain west has been getting hammered with snow. While it is not unusual for the east to be cold and snowy, out here beyond the 100th Meridian (thank you Wallace Stegner) our water situation is much more tenuous and every winter matters. Thus far, this is a great one. I suspect all the reservoirs are going to fill this spring. Below is a satellite image of California taken on February 21st. The Pacific Crest Trail is marked on the image. 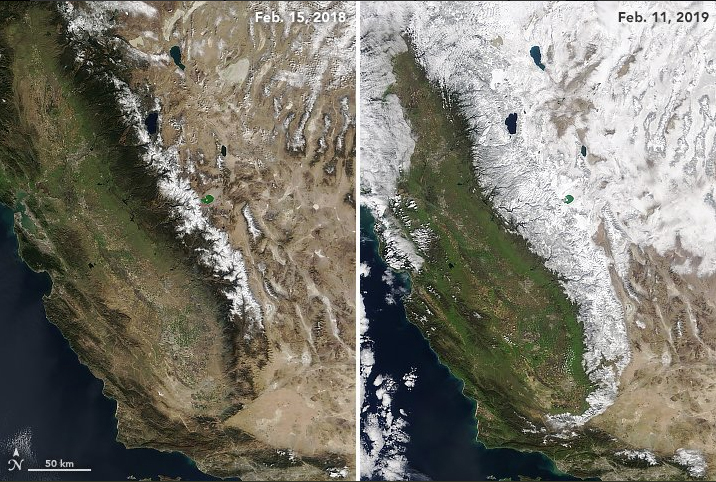 Here Northern California, there is plenty of snow in all the mountains. Where there isn’t snow, things are vibrant and green. It is not just a muted or deep green but that classic springtime California neon green. It is times like this that places like Sonoma County or parts of the Sierra foothills are premier hiking destinations. Up here in the North State, We have obviously gotten a healthy dose of precipitation and are on the cusp of even more. I hope everyone enjoys skiing because it is a great season thus far! This comparison speaks for itself. Last year was not terrible, but is was below average. This winter is not epic but it is well above average at this point. Thank the Lord that water for another year has been provided. As we near the end of February and have one more month of potential for really large storms to hit before spring finally starts to set in, I am certainly getting anxious to get on with the warm part of the year. I certainly enjoy the snow, but I am ready to get my kids back outside without each iteration turning into a major event of snow clothes and boots and such. For now though, I will be patient and enjoy what we have. 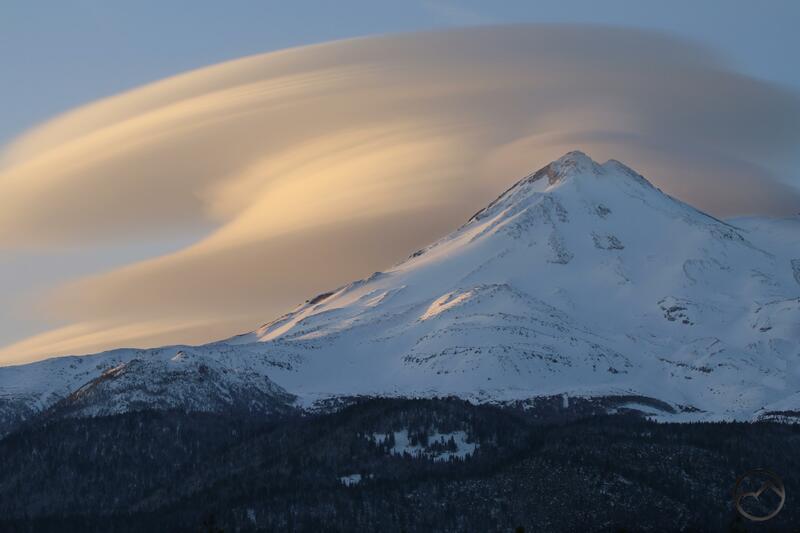 Lots of snow and the chance for more awesome lenticulars! Where the kids play. I am ready for green grass again! I was gone last weekend, having taken my family down to Sonoma County as part of my wife’s birthday activities. Of course, it is when I am gone that something as interesting and amazing as the recent avalanche in Avalanche Gulch occurs. If you missed the images posted by Shasta Mountain Guides, I strongly encourage click here and checking them out! Just like the way the Whitney Glacier continues to undercut the Hotlum Cone, this is a reminder that Mount Shasta continues to take shape and its geography is always in flux. Snow flies off the many peaks of Mount Shasta. Having returned home from being gone for a few days, it was good to see Mount Shasta again. My daughter had a dentist appointment in the morning and while on the way there, I was struck by this view of the mountain. Its array of peaks, the depth of the perspective coupled with the light and the snow billowing off the ridges really struck me. It really impressed upon me the immense scale of the mountain. While several thousand feet above me, it still looked like a series of crags one might see in the High Sierra or in Idaho’s Sawtooth Mountains. The peaks all seemed arranged along the crest of a mountain divide. I think that someone looking at this image could be forgiven for not seeing it as a single mountain but as a mountain range. I have long said that Mount Shasta is a mountain range unto itself and images like this, as well as the volcano’s enormous size certainly lend credibility to claims such as that. Earlier that morning, I had the opportunity to capture another sunrise. The sky was pretty clear but something seemed to muddle the light and the color was not as vivid as I had anticipated it would be. Even if it wasn’t the grandest spectacle I have seen on Mount Shasta but after being away, it was good to share a quiet morning with the mountain, even if it was absolutely frigid. Sunrise on the mountain is great from many vantages but the view from McCloud is magnificent. The numerous crags and the way Mud Creek Canyon seems to pierce right into the Mount Shasta’s heart make it a glorious sight in the morning, as it is lit up by the rising sun. Seeing it compells me to renew my call for the “Konwakiton Trail” off of Pilgrim Creek Road. It would make an incredible sunrise amble. This particular morning, the sunrise had a mottled appearance as the color slid down the volcanic flanks. The snow blowing off the ridges and points caught or shadowed light in a constantly shifting pattern. It was all very fascinating. After the sunrise, I headed back over to Mount Shasta and conditions were beautiful over there as well. 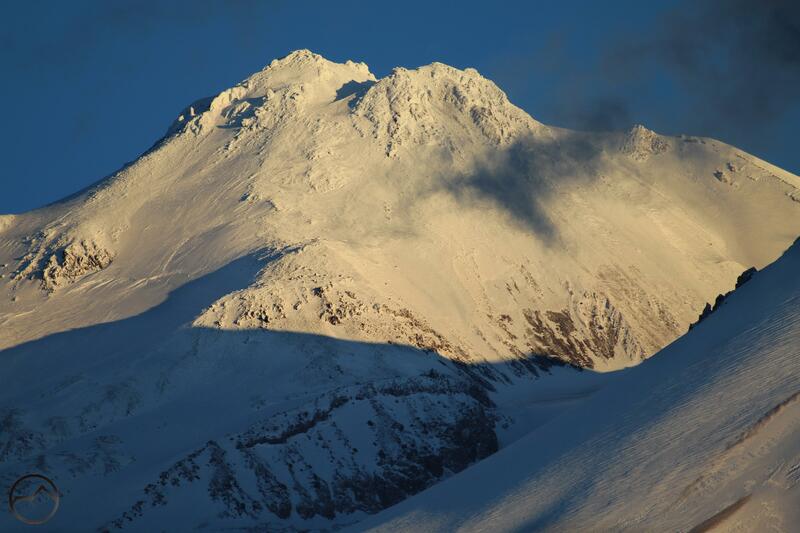 While Mount Shasta was largely in shadow, Mount Eddy and Black Butte were bathed in morning light and fresh snow. All in all, it was good to be back home. Now, of course, it has started to snow again. Not much is anticipated but we shall see what may come. All the ample water we have been getting here in Mount Shasta is certainly the case down in the rest of California as well. Sonoma County was inundated and the Russian River has surged over its banks, flooding parts of small communities like Guerneville. However, the rest of the county was exceptionally green. The wildflowers haven’t appeared yet but the mustard sure has and the fields are alight with neon green and yellow. Taylor Mountain in Santa Rosa, seen from the backyard of my parents new, post-fire house. 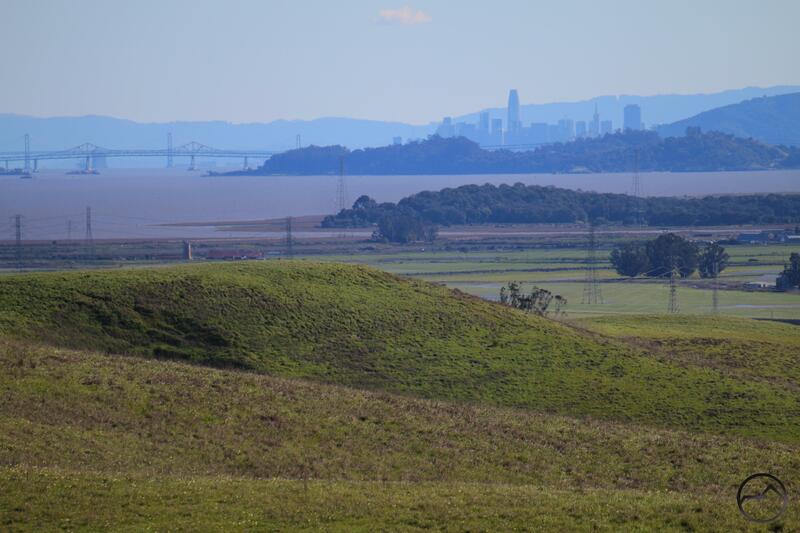 San Francisco from Tolay Lake Regional Park. 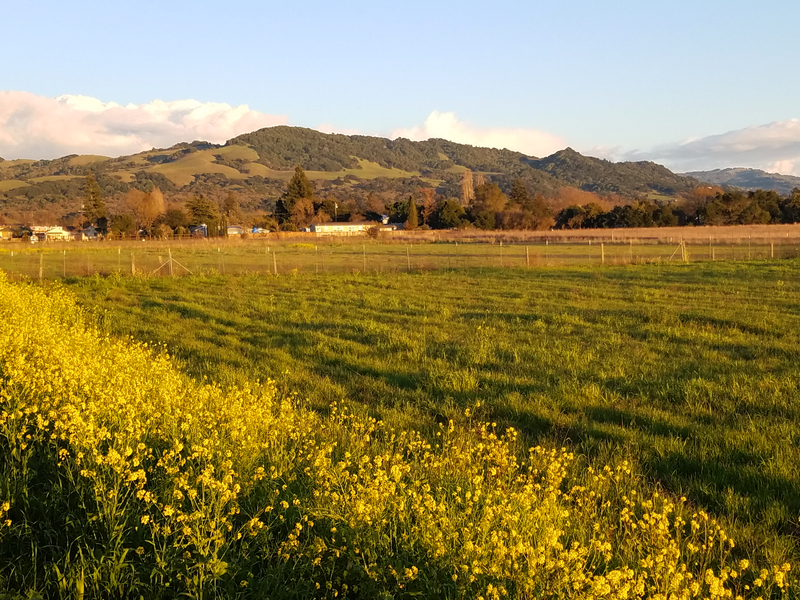 I took my family hiking at Tolay Lake Regional Park while down there and I was reminded how amazing the county park system in Sonoma County is. They have done an exceptional job acquiring land for parks both large and small and have developed an impressive system of trails throughout most of the parks. It really is a miniature national park system, in many ways. The landscapes are surprisingly diverse and extremely beautiful. Most parts of the country would be quite envious of the beauty, the trails and the views these parks offer. Those who live in that area may not know how blessed they are to have such an amazing resource but I would encourage everyone to visit and enjoy these excellent parks! Of course, there is an awesome compliment of state parks to explore as well! Sunrise on Monday morning before the storm. 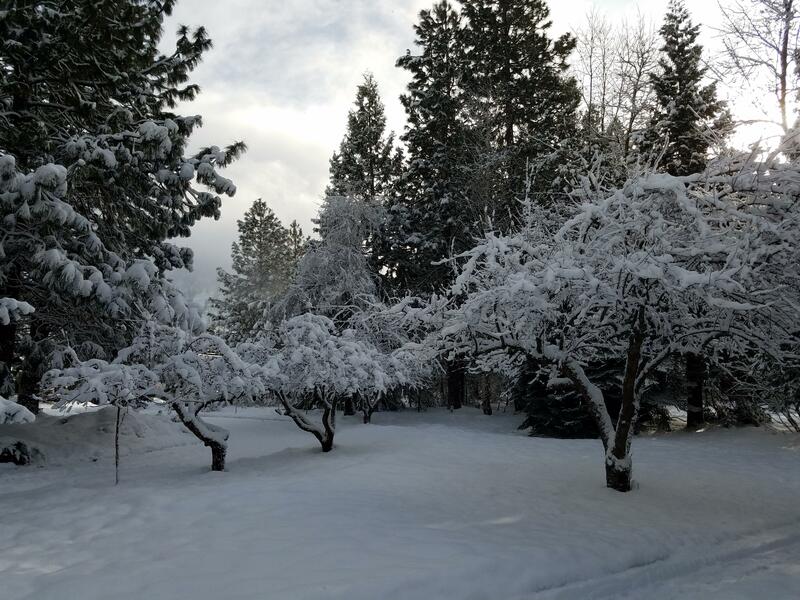 The past few days have seen some significant snowfall in the Mount Shasta area. Snow was predicted nearly every day of the week, through, as is often the case, the reality varies somewhat. The bottom line, however, was that we got hit with a solid amount of snow, totaling as much as 2 feet in the higher parts of town. This was easily the strongest snow storm we have had since January of 2017. The storm seemed particularly strong in the south, where Redding got an unusual amount of snow. Some reports stated that as much as 10 inches fell there. Whatever the amount, it was a substantial amount, especially considering that there was already some snow on the ground from a previous storm and that the bulk of the white stuff fell in a 12 hour period. Even though it proved to be a fair amount of work, I am grateful for what we got. Of course, it initially seemed like the storm might fizzle. Though the bulk of the storm was expected Tuesday, some precipitation was forecasted for Monday. The sky roiled with storm clouds but things remained dry. 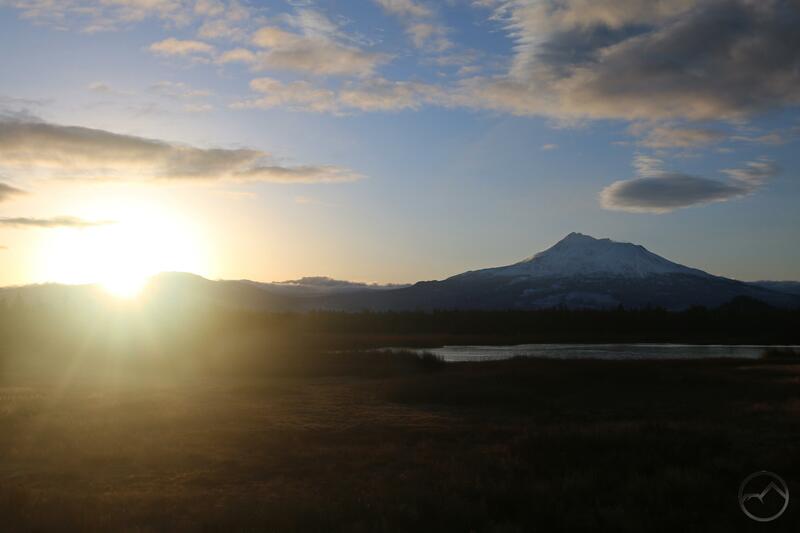 In the morning, I was even able to catch a sunrise over the mountain from the Shasta Valley. A single disk floated above Mount Shasta while the storm could be seen as a bank of clouds that came to a sudden halt at the pass around Black Butte. All through the day these conditions persisted. In the afternoon I was still able to see Mount Shasta clearly from the north while the area immediately south was covered in dark clouds. Little fell Monday night but by Tuesday morning, activity really picked up and it snowed all through the day. By evening about 5 inches had fallen but the intensity of the storm only increased. Snow fell all through the night. When we woke up Wednesday morning we were delighted to see that almost 2 feet of snow was on the ground. The snow was quite dry and powdery. This, coupled with strong winds, made for some really unusual drift patters. Ultimately, however, many areas were quite deep and so the work of digging out commenced Wednesday morning. Fortunately, technology affords some serious aid when it comes to moving snow around. Naturally, while I worked (and my wife was busy saving lives) my kids thrilled themselves with sledding and building snow forts. It was a lot of work but fun. The one thing that was a bit of a surprise was how totally unprepared the city and county were. The roads were in terrible shape, both out along Old Stage and also in town. There have been plenty of large storms but the conditions on the roads never seemed to be as bad as this. The road I live on was not plowed for the first time until afternoon on Wednesday. Nothing on Tuesday, nothing Tuesday night and then not until well into Wednesday was the snow pushed off the road. It was really deep and messy and I am uncertain why this problem was manifest. Thursday proved to be windy but with little precipitation until after dark. I did swing around to the north side to see if I could spot Mount Shasta. No such luck this time, as the mountain was covered in cloud, though the view to the north was quite pleasing. Black Mountain rises impressively above the Shasta Valley. It will likely be a little while before Mount Shasta is visible again. Until then, a closing image of Black Butte will have to suffice. Stay safe and enjoy the snow everyone! This post was written Thursday night. As expected, the storm dropped 4 more inches during the night. Another 3-5 are anticipated later today and possibly again tonight before the precipitation tapers off. It’s not the biggest storm we have ever had but it is a solid contribution to the snowpack! Fresh snow on Friday morning. Mount Shasta is in there somewhere. 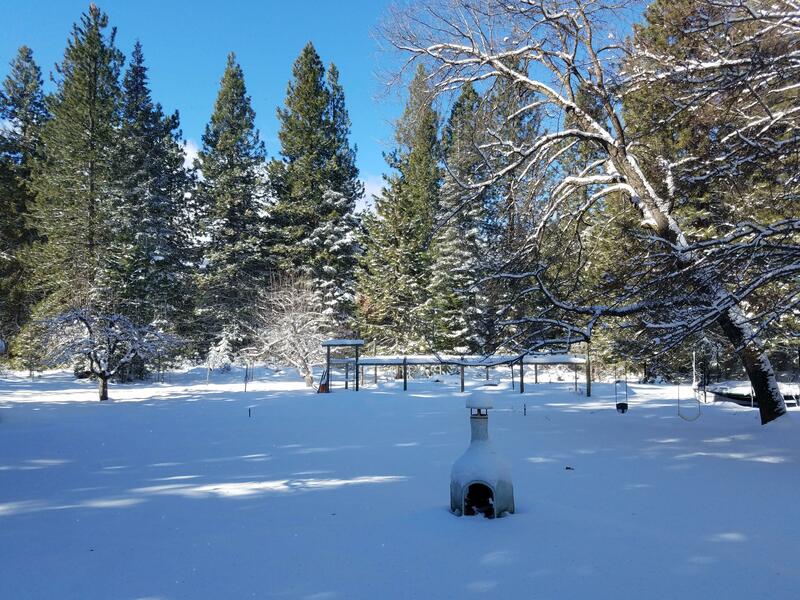 We have gotten a few inches of snow over the last few days here in Mount Shasta. The sun has decided to come out for the next day or two but the temperatures have dropped down into the teens at night. I would say this might be coldest spell we have had so far thus winter. With precipitation coming back into the forecast on Thursday, we may yet get another good dose of snow in the days ahead. For now though, it is a bluebird day out there, with snow clinging to the trees in the frigid air amidst sunny blue skies. This morning I headed out for another sunrise, hoping Mount Shasta would be visible. It was unfortunately not, ensconced in a cloudy dome. The only prominent landmark visible was Shastarama Point. It was enough to prove the mountain’s presence. The clouds also made for a fine catcher of morning light as the sun came up. 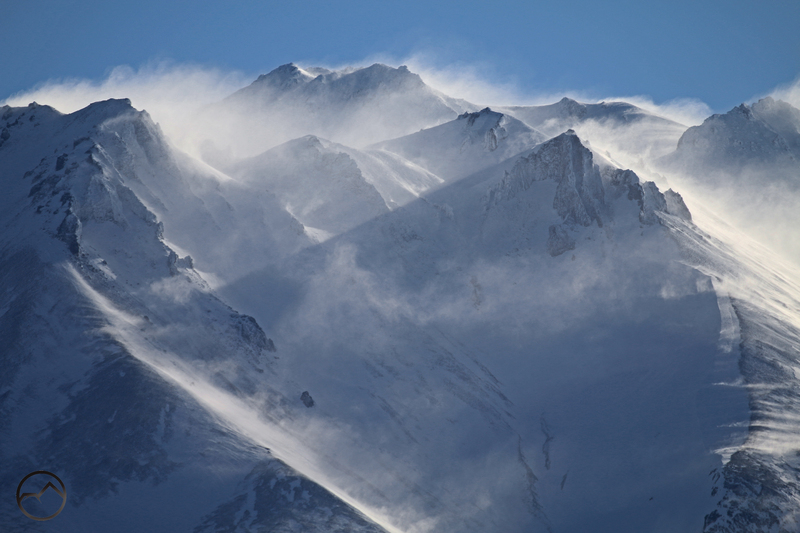 The wind was howling as I stood by the camera and drifts of snowy powder flew about. I had open finger-tip gloves on and while my hands were warmish, the tips felt like they were going to fall off. Thank goodness I am not in Wisconsin! After packing things up at my Mount Shasta vantage, I began to head home but I had to stop and capture some images of the area’s two other noteworthy peaks. 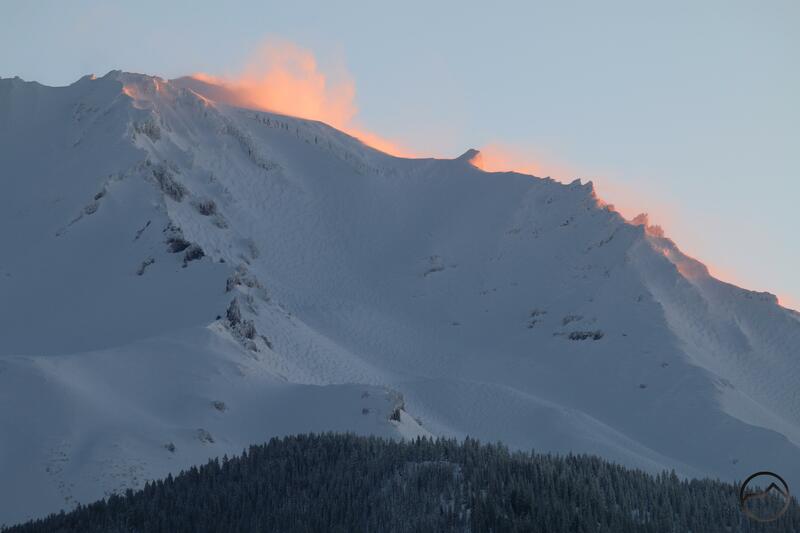 Mount Eddy and Black Butte were both glowing as the suns light flooded the lower elevations. On Black Butte, I am always fascinated by the thick rime ice that develops on the trees. Through a telephoto lens they seem to me to look like movie miniatures. I can’t say why. 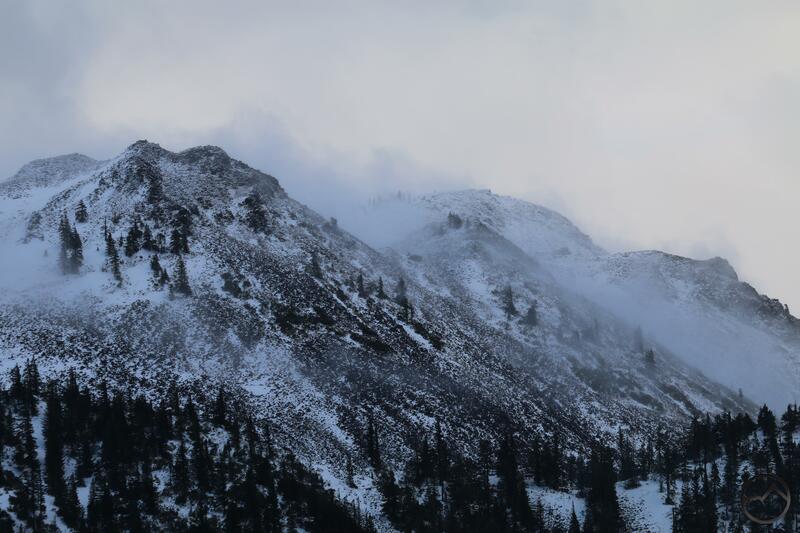 Mount Eddy was partially obscured by clouds but the long ridge rising above the south side of Eddy Bowl was quite visible. Its icy condition and position above the clouds gave it a sense of real height and massiveness. It was all quite beautiful and I was glad to have seen it, despite the cold. The next two days should be gorgeous. After that, I am hoping for a strong snow storm. Start praying!